Coach Coop in real life! The other day, I bumped into the real-life Coach Coop at a baseball game at Bond Park in North York, Ontario. My son is one of 10 young baseball players that Coop (and several other North York coaches) have coached over the years. A bunch of those kids happened to be playing, so he came by to see how his young proteges were faring. As you’ll know if you’ve read Tagged Out, the real-life Coop let me use his name for the Coach of the fictional Toronto Blues. “Coop” will also feature in the upcoming Home Team (to be published in 2018). In Tagged Out, I gave Coop a faux hawk but I think the real-life Coop was none-too-pleased about that. For Home Team, I’m thinking I’ll let him keep the beard. What do you think? Rain, rain, go … into my new book! This 2012 photo is from the Bridgewater Eagles website. The rain has cancelled my son’s two games today and all of the games at Christie Pits. But if you read Tagged Out, you know what “rain” means to the kids on The Blues — Mudball! So, instead of writing the chapter about the Blues vs. the Pirates for my new book, Home Team, I’m instead writing the Mudball chapter. Rain, rain don’t go away — because it’s Mudball time. Thank you, to all the students, teachers, librarians and other people I met in Alberta during TD Canadian Book Week. I saw deer, and prairie dogs and a moose and fiery oil wells and gorgeous freight elevators. I ventured down dusty country roads and stayed in the heart of big-city Edmonton. I met the most amazing people. And I loved all of it. If your students write me, I will answer them. If they send me a drawing, I’ll post it in my online kids’ art gallery. If you want to book a Skype visit with your class, please let me know. Thanks again, Alberta–it was a blast. Let’s do it again sometime soon! The students and teachers at Holy Family School in Red Deer dressed up as literary characters, to celebrate book week. Which characters can you name? I visited them this week on the TD Canadian Children’s Book Week Author Tour. CCBC author profile – with insider info! Want to know more about the sequel to Tagged Out, and how Tagged Out came to be? Or how I got out of gym and recess for a whole year in elementary school (not that it’s a good thing…)? Check out this profile in the Canadian Children’s Book Centre’s newsletter. Yeah… probably not the principal’s best call, to let me out of gym and recess… but I do thank him for it! Some people will do anything to avoid being tagged out! 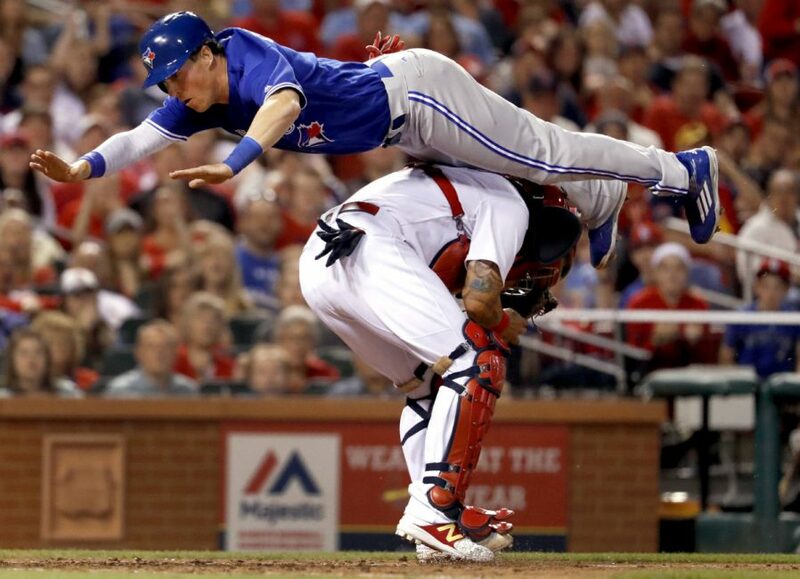 Blue Jays’ Chris Coghlan sprints for home… catcher about to tag him… leaps in the air and performs a somersault *over* the catcher, to touch home plate. Safe! Here’s the article in the Toronto Star. So, so good. Thank you to the Deakin Review of Children’s Literature for this thoughtful, smart review, by Leslie Aitken, of Gabby: Drama Queen. If you want a Gabby book with a bit more plot, a bit more going on–a bit “busier”–than Drama Queen is the Gabby for you.